Today we are discussing bream and their upcoming spawning run which will be upon us anytime. 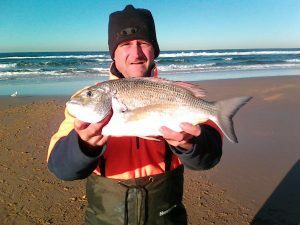 Each year from about April through until August our ocean Beachs and Estuary systems are awash with bream during their spawning run, similar to that of the mullet although the bream will take baits. The best baits for bream depends on where you are fishing; Bream are a scavenger fish and will take almost anything, although when fishing consider the environment and what they find naturally. For example, fishing from a beach with vast amounts of pipis use the bait that is found naturally. Many times, when cleaning bream you can identify what they are eating through the contents of their stomach. Here we recommend pipis and mullet fish baits, off the Break wall live yabbies, prawns or fish baits work best. The bream will be a lot more aggressive this time of year and are in top quality condition. The method used to catch bream will differ slightly dependent upon the environment where you are fishing. Throughout the week, we will talk about the best baits, locations, tips and methods for bream, so if you’re going to target bream be sure to tune in each day this week. The best baits for bream at this time of year is either fish baits, yabbies, worm or pipi baits. Bream are a scavenger fish and will take almost anything, although when fishing consider the environment and what they find naturally. For example, fishing from a beach with vast amounts of pipis use the bait that is found naturally. Many times, when cleaning bream you can identify what they are eating through the contents of their stomach. The legal size for bream is 25cm with a bag limit of 10. Bream can be found in numbers around ocean rocks and beaches. 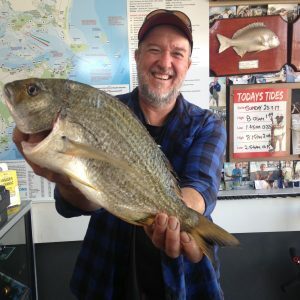 The hot spots for catching bream are the Torpedo Tubes, Little Beach Wharfs, Nelson Bay break wall, the Anchorage Break Wall and Sally Shores Wharf. Good tip when fishing the estuary is to berley and hold the fish – we recommend chicken pellets made into a bread type doe and tossed in as a ball, hence it will sink and then disburse. Top beach spots for beach are Fingal Bay, Box Beach, One-mile Beach, Samurai and Birbui. The method used to fish for bream. 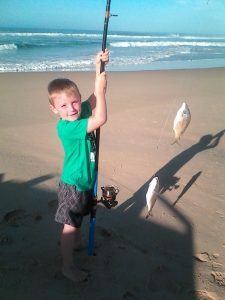 On the ocean beaches bream, will bite in different ways depending upon the phases of the moon. Majority of bites bream will pick the bait up and pull away. In this case give them a little line, by either dipping the rod or walking forward then strike, this ensures the fish gets the bait in its mouth. Many times, bream will swallow the hook. If set rods in rod holders circle hooks are recommended. In the estuary fish light, its recommended a 00-running ball sinker to the 1/0 suicide or similar hook. Mustad Penetrators are a fav. Hook choice among bream fisho’s. 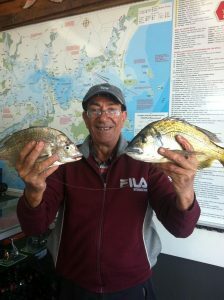 Float your bait down and give the fish line Hot spots to catch bream in the Bay. Torpedo Tubes, Pool off the Hospital, Little Beach Small Jetty, Nelson Bay Break Wall both inner and outer walls, Anchorage and Wanda Head. Berley for bream which always increases your chances, chicken pellets are dry and easy to use. Simply soak pellets in salt water turning into a doe, then make into a ball and throw in. The ball will sink under the water surface and begin to disburse around the 5 feet mark. To find out if the berley is working, when cleaning your fish check their stomach contents for traces of the berley pellets.